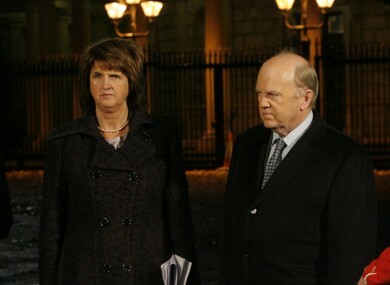 Joan Burton and Michael Noonan appeared to be at odds over the introduction of the private sector pensions levy, according to documents obtained by Fianna Fáil. INTERNAL GOVERNMENT DOCUMENTS have revealed the internal differences between Fine Gael and Labour over the introduction of the private sector pensions levy three months ago. The documents, obtained by Fianna Fáil under the Freedom of Information act, also reveal the how the government disregarded the ‘serious concerns’ of the pensions industry when it decided to introduce the levy as a way of funding Richard Bruton’s jobs initiative. The controversial levy is expected to raise €1.9bn over the next four years, but may force some pension funds to wind up completely in doing so, the documents suggest. A briefing note prepared by the Pensions Board for social protection minister Joan Burton outlined major reservations about the viability of many pensions if an extra levy was put in place. A reduction in the assets of the scheme is likely to impact on the ability of a scheme to pay benefits to its members… It is possible that the introduction of a levy will force some schemes in deficit to wind up. An undated letter written by Burton to Michael Noonan later that month reproduced exactly the same words – and also expressed concerns that the pensions levy would act as a disincentive for people to save for their retirement. Separately, the chairperson of the board Jane Williams wrote to Burton to outline further concerns, saying the levy “raises a number of issues [...including] the effect of a levy on scheme solvency”. The documents released by Fianna Fáil do not include any response from Noonan to these queries. Noonan has previously conceded to the Dáil that he did not hold formal consultations with the Pensions Board before he introduced the levy. This morning Fianna Fáil’s new finance spokesman Michael McGrath accused Noonan of deliberately failing to mention the contact between Burton and the Pensions Board. “The Government pushed through the pension levy despite being warned about its impact by The Pensions Board, denied to the Dáil that there was any consultation with the Board in advance of the decision, and exempted some of the wealthiest people in society from the levy contrary to the advice of the Board,” McGrath said. All links open the documents in PDF format. Email “FoI documents reveal government's split over pensions levy”. Feedback on “FoI documents reveal government's split over pensions levy”.